A neuroma is a painful swelling of a nerve, usually in the ball or heel of the foot. Pain is often soothed by taking weight off the foot or by massaging the area. In the foot, there are the long bones (metatarsals) and thin nerves running between them. The nerves split in a Y-shape when they reach the toes. If the metatarsals move abnormally, they can pinch the nerve between them, causing inflammation and eventually, permanent nerve damage. 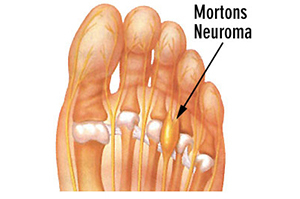 Morton's Neuroma is the most common of this type and affects the nerve between the third and fourth toes. Neuromas may also occur after a nerve has been injured, either from a traumatic wound or from damage suffered during surgery. A physical examination and one or more imaging tests will determine whether the pain is caused by a neuroma or by a condition with similar symptoms such as arthritis, stress fractures, tendon inflammation, tarsal tunnel syndrome and nerve compressions in the ankle or leg. Treatment begins with a combination of cortisone injections to reduce swelling and orthotic inserts to correct problematic metatarsal movement. If the nerve is permanently damaged, the patient may decide to undergo chemical destruction of the nerve, have the nerve surgically removed, or endure the pain. To learn more about Neuroma & Podiatric Services, please contact us at 410-749-0121410-749-0121 today or click here to schedule an appointment.